The Wicked + The Divine #16 Review – AiPT! The Wicked + The Divine #16 gives us the backstory of two gods with a lot of history together. In the present, Minerva is begging Baal to let her talk to the captured Morrigan, who is being held in a cage of Woden’s creation in Valhalla. Baal reluctantly agrees to let her join in, and her innocent question of why Morrigan feels like this is all her fault brings us to the flashback of their human lives: both the Morrigan AND Baphomet. Flashback to two years earlier, to the gods when they were Marian and Cameron (and never more goth or in geeky love in their lives), playing the LARP “Vampire” and painting figurines. Things are going well in nerdy romance, until Cameron gets a phone call that changes his life: both his parents have been killed. Unfortunately, Cameron can’t let go of the nihilism or his destructive habits; his smoking sets a trash can on fire after he admits to Marian he’s cheated on her. After cleaning up his mess, Marian storms off into a graveyard and runs into Ananke. With barely a sentence, Ananke changes Marian into the Morrigan. The Morrigan is communing with her flock, when Cameron appears out of the group. After he admits that he always knew she was special, the Morrigan goes to Ananke with a request: make Cameron one of the gods. As she leaves, the Morrigan’s meal begins to talk to her, with Baphomet forming his image from the ketchup on her burger, saying that he can explain everything. This issue has a much lighter tone than I was expecting for a book focused on two gods of death, but in the WicDiv world, I probably should have expected that. It’s a bit of a relief to have a book with so many jokes, though Gillen’s end note reveals that we’ll be back to the “tearing your heart from your chest and placing it in your mouth” story in the next issue. Let’s start with the main story: two nerdy goths in love. Two kids playing at death, literally, pretending to be vampires in the dark. And then we get two very different responses to the reality of death: nihilism and hope. We also again see humans who reflect their god attributes before they are turned, and seeing Ananke’s reaction to meeting Marion in the graveyard reveals more questions: can she see qualities of a person that determine which god they will fit? How does she find the people to turn, if they aren’t offered to her? Did Cameron fit Baphomet, so he was possible to change at the Morrigan’s request? Many, many questions. When Cameron comes to find Marion and watch her as the Morrigan, her request to turn him feels like a mixture of their two human personalities – she’s giving him a chance to dance the ultimate dance and then fall into the pit more spectacularly than they could have possibly achieved as humans, making their game reality. For all that I love puns and jokes, and oh do I, the type and prevalence of them in this issue made the tone feel off — just not typical of this book. It threw me out of the story a bit, like there was a different writer along with a different artist for the issue, trying to imitate the style and not getting it quite right. I would love a Minerva-centered story, but I think it might completely break my heart into pieces. Minerva is by far the most tragic character to me, so young to only get two years to live. But once again, in this issue little Minerva lives up to her godhood by seeing the hidden truths, though she is still the only god who is starting to see the entire picture. I’m definitely going to be looking up her other work. Last but not least, we get the one page shot to close out the book. The former members of Cassandra’s team manage to capture some footage of the Morrigan in her station, but when they review it, they see a glimpse of Beth’s hospital room as well. Could they have caught her actually killing? Edit note: Jamie McKelvie tweeted me that these guys are NOT part of Cassandra’s gang. Sigh. This is what happens when I try to get clever. I’m so happy we got to catch our breaths for a month, because the arc end is coming and I have a feeling it’s going to be the most heart-wrenching yet. 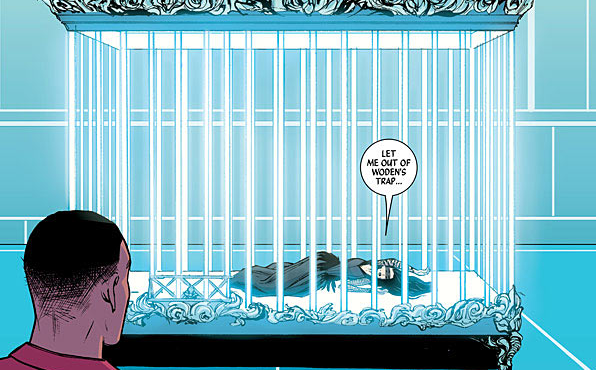 I wouldn’t trust my pain to anyone none more goth than the The Wicked + The Divine team.